Drawing on the concept and trend of creating locally sourced interiors, with designs finding influence in the surrounding environment, the 'Cosmopolitan style with Texan swagger' theme exude the personality of its destination. The hotel's corridor designs were developed first, with fluid oil slick inspired hues spilling down the corridors and guiding guests to their rooms. Transitions have been eradicated, with designs seamlessly turning corners and covering door drops, to deliver a continuous design without visual breaks down the hallways. 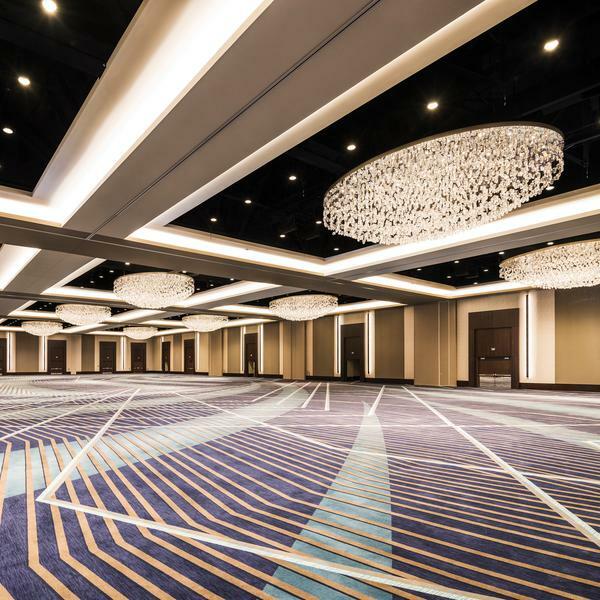 This execution of unbroken design elements is carried through in the public spaces as well, where an aerial look at the interior would show the linear elements flowing through from the ballroom to the pre-function spaces. 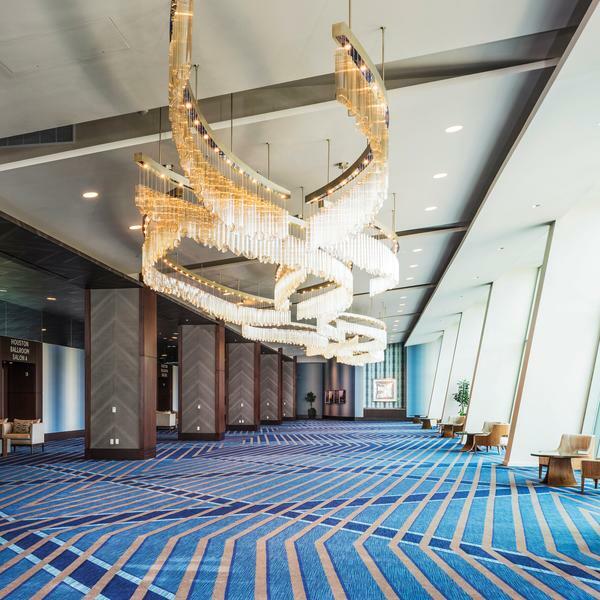 Conceived in the same oily blues and metallic grays of the corridor designs, the ballroom designs take on a more angular approach inspired by the metalwork of an oil derrick. 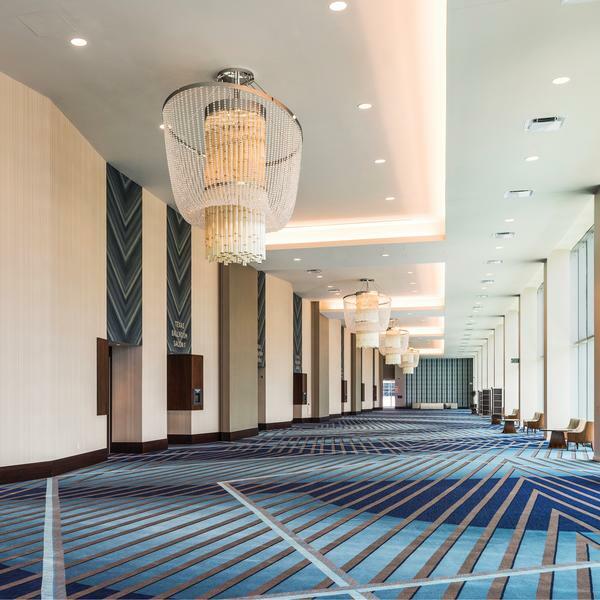 Tall glass windows encompass the pre-function space at the Marriott Marquis Houston, making cast shadows play a critical role in the overall pattern. The area’s custom axminster carpets, specified at a higher density to withstand more rigorous foot traffic, were designed to work with the shifting lines the shadows would create across the carpet plane. The shadows become an interesting kinetic layer, shifting as the sun travels through the Houston skyline like a performance art piece and offering up a different interior experience with each hour of the day. 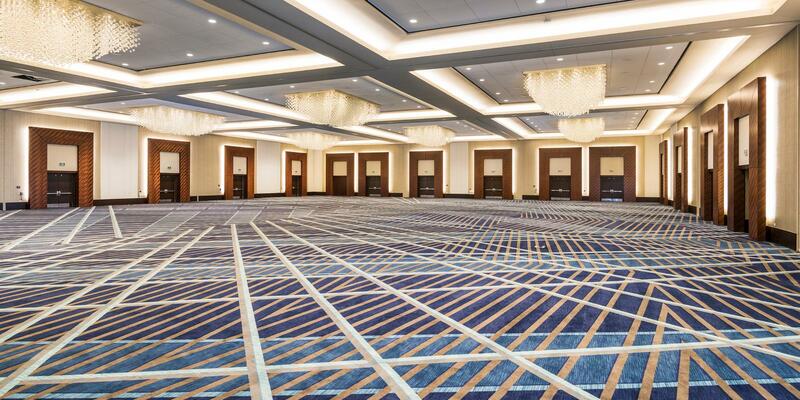 Obviously one of the key components of the interior design is [Brintons] custom axminster carpet, spanning the floors of the meetings and function spaces on 3 entire floors of this 1000 room hotel. The overarching design concept is very much reflected in the carpet design. We used powerful lines, deep tones tempered by luxurious textures, and dashes of highlights that burst through strong geometric patterns overlaid with fluid lines. 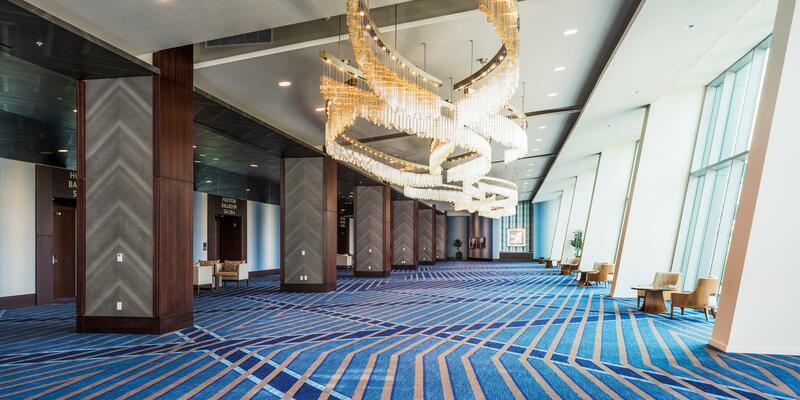 It pulls together the glamorous cosmopolitan style that creates the look of this high profile hotel in Downtown Houston.